Thought Balloons - Creating Comics One Page At A Time: Why Komodo? You ever have that character where you read a series, and they become one of your favorite characters from that series? But then, when it ends, they just kind of…disappear? Despite being part of a larger comic universe? You never hear about anything happening to them, they just kind of fade off? Where about the only evidence they ever existed are those comics where they showed up in the first place and any online references to them? For me, that about sums up Melati Kusuma, AKA Komodo. 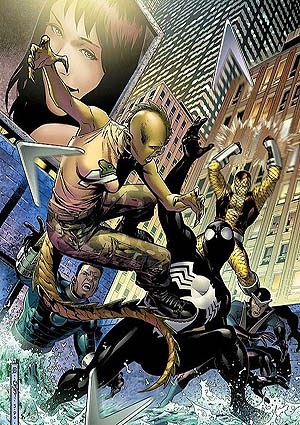 Created by Dan Slott for the Avengers: The Initiative series (one of the first series I read regularly when I started reading comics regularly) – her backstory was that she was a student of Dr. Curt Connors, AKA The Lizard, who was missing her legs and fixed his lizard formula. Well, the part that makes you crazy, at least. Which gave her the power to change into a lizard woman at will with a healing factor that’s just this side of the likes of Wolverine and Deadpool. Granted, she has to stay as a lizard woman if she wants to keep her legs, but it’s not really anything she seems to have a problem with. Pile on top of that the genius she has which allowed her to get said powers – genius I would argue allows her the potential to join the ranks of other B-Level geniuses of the Marvel Universe like Beast and Spider-Man – and both her dedication and flat-out skill as a superhero that made her one of the top recruits of the Initiative series, and you have someone with a lot going for her. Which makes it sad that, since The Initiative ended, she’s all but disappeared from the Marvel U. She’s popped up a couple times since then, but for the most part? Nada. It’s especially troubling since the guy who created her is currently the Spider-Man writer. The same Spider-Man who has Dr. Connors, The Lizard, as a long-time enemy. That’s ‘Why Komodo’. Because I know she has a lot of potential that’s being wasted right now, and I want to see how much of that potential we can use here at Thought Balloons this week. That includes any play at home writers who’d also like to have a go at it! As always, if you’d like to write a script this week, feel free to post it in the comments section of this ‘Why?’ below!